Note: For newer findings on gun ownership, see the Center’s 2017 survey. There are by various estimates anywhere from 270 million to 310 million guns in the United States — close to one firearm for every man, woman and child. But in point of fact, only a minority of Americans own guns. Gun ownership is one of the hardest things for researchers to pin down (as the Pew Research Center’s Michael Dimock, among others, discusses here). A Pew Research Center survey conducted in February found that 37% of households had an adult who owned a gun — 24% said they owned a gun, and 13% said someone else in their household did. The Pew Research Center’s results generally track with the General Social Survey: When the GSS asked last year if people had a gun in their home or garage, 34% said they did. 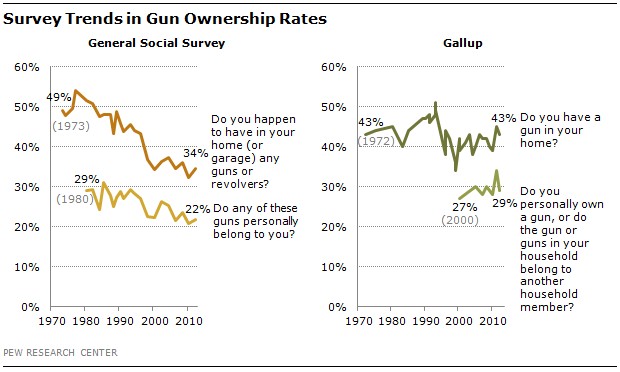 Though other surveys (such as this one from Gallup) have found somewhat higher self-reported ownership rates, by and large they indicate that less than half of Americans own a gun.